In the October Issue of Traveler, our Destination Watch department looked into the ongoing controversy surrounding Trestles Beach in southern California, a shore made famous in the Beach Boys' classic "Surfin' U.S.A." National Geographic magazine Production Coordinator Jeff DiNunzio recently visited the beach and sends us this update. 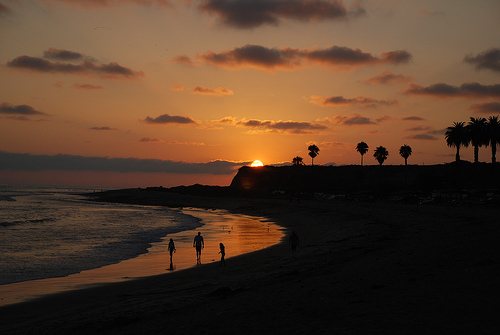 Just below San Diego’s northern border with Orange County sits San Onofre State Beach, or San O. The park includes three distinct areas, the Bluffs, San Onofre Surf Beach, and San Mateo Campground, and over the past year, San O has become a battleground between supporters of highway infrastructure development and challengers who favor fewer cars and preserving the park. The Transportation Corridor Agencies (TCA) want to extend the Foothill Toll Road—Route 241—and link coastal Orange County with its expansion eastward. In order to deal with the estimated 60 percent traffic increase expected in south Orange County in the next quarter-century, the TCA believes the six-lane, 16-mile extension will be a vital accommodation. The road in question falls under the California highway system but is operated by the TCA, which is funded by the sale of bonds to both private individuals and institutional investors. The extension boasts a list of supporters and research on congestion-induced environmental hazards. The addition, however, would cut through a patch of well-maintained terrain in San O, and opponents fear it would threaten the operation of its campgrounds (eliminating all of San Mateo’s 161 sites). 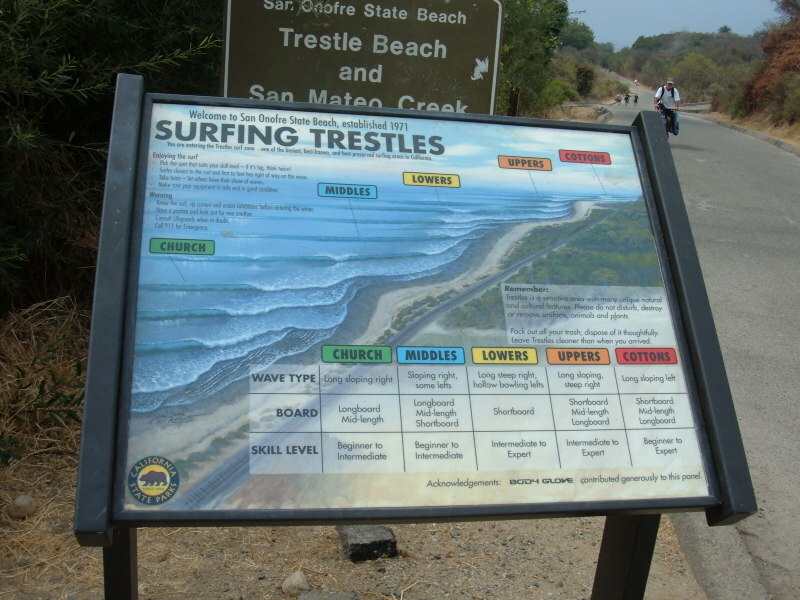 Furthermore, it would diminish water and wildlife quality (San Mateo Watershed purportedly contains six rare or endangered species) and adversely affect the waves at Trestles Beach, which draws surfers from around the world. The assertion that new roads will mitigate, rather than worsen, congestion has met persistent skepticism. Organizations like Save San Onofre, the Surfrider Foundation, and United Coalition to Protect Panhe are campaigning to counter the TCA’s lobbying efforts for approval, boosting press coverage to rouse public support. The surf break, known as Trestles, hosts the only Association of Surfing Professionals’ World Championship Tour (WCT) contest on the mainland United States. Each September, thousands of spectators crowd San O’s shores—already the fifth-most-visited of California’s roughly 270 state parks. So, on Friday, September 12th, I went. But the contest was over and the pros had skipped town. (WCT events have about a two-week waiting period so they can be held in the best waves; thus, end dates fluctuate.) A blessing perhaps. People travel far to attend the contest. But on a normal day, it’s mostly local surfers and beach-goers hiking to the beach. Rather than watch surfers and talk to out-of-towners, I surfed and spoke with the locals. “It’s pretty amazing that sandwiched in the middle of San Diego and that whole L.A. mess is a relatively pristine natural habitat,” said Kyle McGee, a skinny, curly-haired San Diegan who frequently surfs Trestles. “You were out there. You saw how clear the water is. And the white wash from the waves—where else in California have you seen anything that blue?” Nowhere, in fact, except the sky. Today, there is a great number of websites that offer different paper writing services. These sites usually have the same terms and conditions as well as policies for using them. You may think that these sites are just all the same up to the paper’s quality. They’re not. If you seek information about “how to improve critical thinking”, welcome to Scamfighter. The nursing thesis or nursing dissertation is the most timeconsuming and voluminous among the research works of various nursing programs. Therefore, we offer you professional assistance with care research paper. Let us facilitate your life and save your time and good mood for you, for when you order your nursing research papers, you will receive the top quality work. A well-organized teamwork assures of the best result possible. This comment is an eye opener for most student. You need to know this mystery too. I've read about those parrots in the article on qualityessay.com. They are very intelligent and can be kept as home pets. However, it should be taken into consideration that they need lots of space to live in.